Guilbert Jemane is a Breton warrior living in Cheydinhal. He has an identical twin brother, Reynald, from whom he was separated at a very young age, and whom he believes to be dead. Fortunately, his brother is very much alive and living it up in Chorrol. You will help reunite the two brothers during the quest Separated at Birth, help them reclaim their childhood home during Legacy Lost and finally find out the truth about their father when you accept the quest Sins of the Father from a mysterious Dark Elf. While Reynald drinks all day long in Chorrol, Guilbert lives a relaxed and more sober life as permanent resident at Newlands Lodge in Cheydinhal. He sleeps in the easternmost bedroom every night between midnight and 6am. After waking up he strolls lazily around the upstairs area until it is time for a two-hour breakfast in the taproom at 8am. He then heads upstairs again and spends the rest of the morning and all afternoon pacing around. At 8pm, provided that the weather is clear, he finally leaves the Lodge for an evening walk near the local chapter of the Fighters Guild and Willow Bank. He returns to the Lodge at midnight and goes to bed. If it is raining, Guilbert will simply stay at the Lodge. After you inform him that Reynald is alive and kicking in Chorrol, Guilbert will leave Cheydinhal right away, eager to meet his long-lost brother. He takes the Blue Road to Lake Rumare then follows the Red Ring Road until it meets with the Black Road which he will follow all the way to his destination. He will run for the entire trip and will take several detours along the way but his essential status means that he will always arrive safely in Chorrol. Once there, he will seek out Reynald and start a new life, residing in his brothers' messy house in Chorrol. Guilbert will follow Reynald around all day long, which includes witnessing his daily drinking marathon at The Grey Mare between 8am and midnight and watch him in his sleep, never eating or sleeping himself. The Jemane brothers enjoy food and drink at Weatherleah. 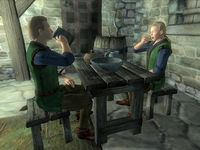 After you have initiated the Legacy Lost quest and have located Weatherleah both Jemane brothers will keep up the Chorrol routine until you tell them that their childhood home is safe after the unfortunate invasion of three Redguard Valley Ogres. Once you tell Guilbert this, he will stop following his brother and will instead follow you all the way to Weaterleah, once again starting a new life upon arrival: Provided that he gets to the single bed before Reynald, he will sleep every night between midnight and 6am amidst all the skulls, skeletons and bones left behind by the ogres. After waking up he ventures outside and strolls around near the house for four hours. At 10am he reenters Weatherleah but the absence of any food in the trashed house makes him wander around the attic for two hours. He heads outside again at noon and stays outside until his bedtime at midnight. Once Weatherleah has been rebuilt, Guilbert will change his routine slightly: food will now be available on the ground floor and he will, at 10am, eat a late two-hour breakfast with his now sober brother. Unfortunately, no extra beds are provided after restoring the house, so the brothers will have to keep fighting for the single bed at midnight. He wears a blue and green outfit with a pair of doeskin shoes. He carries a spare pair of tan linens, a small amount of gold and wields a leveled warhammer that can be of up to ebony quality. When you approach him in Cheydinhal and tell him about his brother being alive in Chorrol, he will be shocked: "He... he's alive? I was told that my mother and brother never survived! This is amazing! I'll need to go see him at once! You'll have to excuse me; I'd better leave right away. But, please -- come and see us in Chorrol. It would be wonderful for us both to be able to thank you for helping us find each other again." Once you exit the conversation he will add: "This reuinion will be the happiest day of my life." 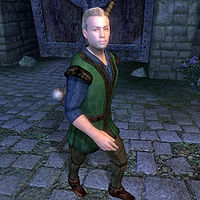 After having met up with his brother in Chorrol he will thank you with all his heart: "I can't thank you enough for helping to reunite me with Reynald. I never would have guessed he was still alive. We have much to discuss, but if you have time, I'd beg you stay a moment longer and hear about our home, Weatherleah." If you ask him to tell the tale he will go on: "Weatherleah was our family's home for generations. Our parents fled it when ogres attacked; they became separated. My father carried me to safety. He later returned and believed Reynald and my mother had perished. Since ogres are cannibals, he didn't expect to find their bodies. Thankfully, however, it seems that my mother managed to carry Reynald to safety. While my mother didn't survive, Reynald did, and for that I'm grateful. But we both want more - we want our home back. We're not fighters; you appear to have more skill than either of us. Would you go to Weatherleah, and see if it's still inhabited by ogres?" If you accept this task he will continue and point you in a somewhat wrong direction: "Thank you! Now, we're not quite sure where the estate is located. We'll offer up what we know, however. We believe it's somewhere south of Chorrol, but north [sic] of Fort Carmala. It may be difficult to find. Since no one's lived there for many years, it may be quite overgrown by now. If you find it, let us know. We'll be waiting anxiously." When asked about Weatherleah again he will once again provide false information: "I wish my father had given me a better description of its location, but for some reason all he told me was "South of Chorrol, north [sic] of Fort Carmala." After you have been given the right directions from Sabine Laul and have discovered that the ogres still inhabit the farm, Guilbert will task you: "You mean there are still ogres there? I hate to ask more of you, my friend, but you know that we're not warriors. Please let us know when it is safe to travel there. We're anxious to return." After you have slain the ogres he will say: "Wonderful! Weatherleah is ours! Are you ready to take us there now?" If you confirm this, he will say: "Very well. We're anxious to return to Weatherleah, so be sure to let me know as soon as you're ready." Safe and sound back in Weatherleah he will once again thank you: "Thanks so much for getting us here safely! I'm afraid we aren't very wealthy, but here is all I can offer you at this time. Please, visit us again soon." He will add: "You are welcome here anytime, my friend!" This page was last modified on 5 March 2019, at 05:37.